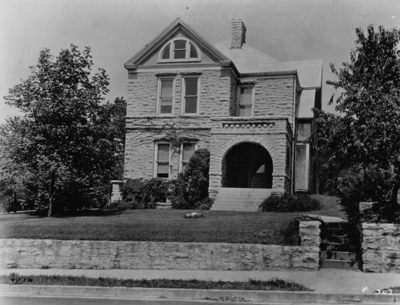 WKU acquired the Robert Underwood home in 1923 and it was first used to house the music department. Originally the building was home to Richard Underwood, who designed it. Western Kentucky University acquired the house in 1923. "One of the most versatile buildings on the Hill, Diddle's Dorm, which was originally a private home, was purchased by Western and became the home of the Music Department until the present Music building was constructed. Used as a girls' dormitory it was known as the "Little Dorm" during World War II when the air cadets had preempted both girls' dormitories. In 1944, the building became an athletics' dormitory managed by Coach E.A. Diddle and rechristened "Diddle Dorm." [Talisman, 1949] In the earlier days there were classrooms that were used for English, History, Education and Music. When it became "Diddle Dorm" in 1950, Coach Diddle and his wife lived in the front part of the building while most of his players lived in the back. Diddle lived in the house until his death in 1970. Mrs. Diddle lived there until 1978. In 1978, after renovations had been made, the front of the house became the team manager's apartment. Players lived in the dorm until 1994. The building was razed in the summer of 1994 due to termites. "Diddle Park" was created on the site. Stones from the house were reused to make steps and benches. Harbison, Robert. "The Strange Little Stone House: The History of the Underwood Home - 1529 State Street," Folk Studies 464, Fall 1992. Available in Folklife Archives - FA160.